(MENAFN - Muscat Daily) Muscat- For the second consecutive year, Maserati is the official car in the 41st edition of the Cannes Yachting Festival, with a comprehensive programme of events placing the Trident Brand firmly in the centre of Europe's top yachting show. 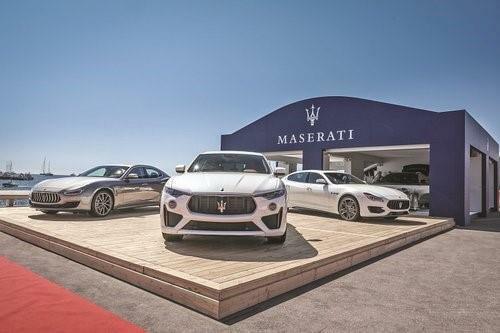 Throughout the event, the Croisette will provide the backdrop for test drives involving the entire Maserati 2019 range: Levante, the first SUV in the Modena constructor's more than a century of history, the Quattroporte flagship and the Ghibli sports sedan will be available to guests and customers for test drives on a route carefully chosen to highlight the performance, driving pleasure and comfort. From September 13 to 15, during the exclusive 'Drive & Sail' programme, as well as taking the cars on-road, participants will also have the opportunity for an experience on board the Maserati Multi 70, skippered by Giovanni Soldini. The high-tech racing trimaran and its crew offer the opportunity of an adrenalin-packed experience of flying across the waves, in a vessel that is a cutting-edge work-in-progress, always seeking to evolve and improve performance. In February, Maserati Multi 70 set the new record on the Tea Route of 12,948 nautical miles from Hong Kong to London, which it covered in just 36 days, 37 minutes and 12 seconds. The 'Drive & Sail' experience is the ideal combination of technology, performance and lifestyle, all typical of the Trident Brand and echoed across the Maserati 2019 range, enhanced with discreet updates to the styling and new, exclusive contents. Throughout the festival, customers and guests will be welcomed to the Maserati Lounge, an exclusive space within the Vieux Port, Palais 239. Inside the Lounge, visitors will be able to view the MY19 range, all featuring the powerful V6 and V8 petrol engines that deliver the perfect mix of performance and comfort, with the unique sound that identifies all Maserati cars. The new Levante GTS, launched in July at the Festival of Speed at Goodwood (UK) and star of Monterey Car Week in California in August. The eight cylinder 3.8l V 90° Twin Turbo engine, teamed with the Q4 Intelligent All-Wheel Drive System, delivers 550hp at 6,250rpm and 730Nm peak torque between 2,500 and 5,000rpm. The Levante GTS surges from 0 to 100kmph in just 4.2 seconds and has a top speed of 292kmph. The Quattroporte GTS MY19, the Trident Brand's flagship now in its sixth generation, is fitted with the 3.8l V8 engine and is a perfect example of traditional Maserati performance. This powerplant generates 530hp at 6,800rpm and a peak torque of 710Nm at speeds between 2,250 and 3,500rpm, thanks to the automatic overboost function. The Quattroporte accelerates from 0 to 100kmph in just 4.7 seconds and has a top speed of 310kmph. Also present are a Levante SQ4 in GranLusso trim and a Ghibli SQ4 GranLusso, both MY19.